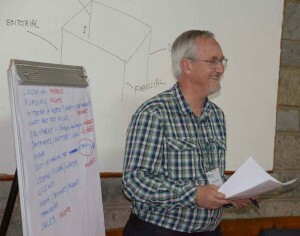 He made a sketch of a four-legged table on the white board and asked us, “What are the names of these four legs?” We, the participants in this 3-part financial management workshop at LittWorld 2012, started to answer Tony Wales, global publishing consultant. “Yes, that’s correct.” Tony wrote it on the board. “Yes, Editorial, what else?” He wrote the name of another leg. “Yes, and what else?” He named the third leg. “But, what is the difference between marketing and distribution?” Someone asked him. “Yes, financial,” wrote Tony, “And what would happen if one of these legs is shorter than the others?” We nodded, looked at the picture, the message was so clear for us. The class was so quiet as we pondered what he said. Yes, do we know the cost of doing the job, and do we have a plan for it? Previous Permisi, bolehkah aku masuk?